"They taunted and made sexually explicit gestures towards me out the window." Jenny Stanley of Dublin bravely recounted her experience enduring a night of catcalling in a powerful letter to the Irish Times. In the letter, she describes how dehumanizing and terrifying the experience of being singled out by packs of verbally abusive men is for women who dare to exist in public. 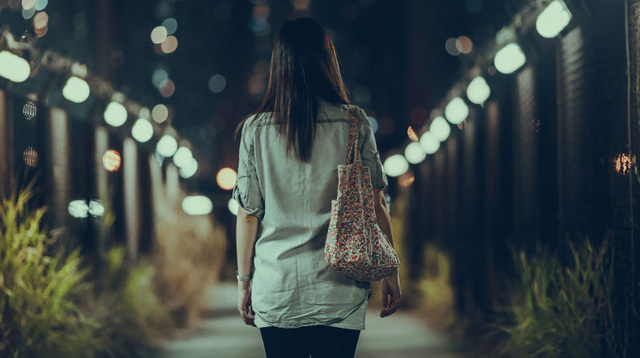 Stanley described walking home at night after work ("the source of overwhelming feelings of degradation, objectification, anger, fear and raw sadness") and feeling an immediate sense of dread as she ​encountered several groups of all-male parties approaching her from various directions. I can find no word more suitable to describe these groups than 'packs', based on their behavior towards me, one another and other members of the public. As I stood at my bus stop, the wolf whistles, comments on my physical appearance and "hellos" loaded with intention began and brought with them those well known feelings of self-consciousness, awkwardness and embarrassment that I am certain countless women in Dublin face on an irritatingly regular basis. My experience of this night has made me realize that I have become somewhat desensitized to this kind of behavior and so my reaction to these acts was quite muted. I stood, I waited, I ignored. They continued. It was not until one group in particular passed that my vulnerability became acutely apparent. ​Then, Stanley described what happened when a man announced he had an interest in her, referring to her as "that one." It began with one group member looking directly into my eyes, pointing at me, turning to the others and announcing, "I fancy that one." That "one". To which another member replied in agreement, suggesting what he might like to do if he got me home. To which another added further details to this imagined scenario in which I was an object with the sole purpose of fulfilling their desires; details which filled me with pure white rage and, if I am honest, questions around my own value as a person. If I can be seen in this way, I must not be perceived as an equal member of society by these people. Right? My thoughts were supported by the roars of laughter that followed as the group passed me by. They laughed, I became filled with fear. I was alone and it was now screamingly obvious that not only was I a source of entertainment for these groups, but a target. ​Stanley said she was also struck by the faces of other women on the street enduring similar ordeals. "Why don't we say something back?" she wondered. "Why don't we tell them that we deserve more than to be objectified in this way? Why don't we explain why we respond to their 'compliments' of how attractive we are with a stare of distaste rather than the gratitude they so clearly feel entitled to?" She said she was scared during her long trip home from work, staying close to the driver as the bus traveled on. "​I was furious that I allowed this fear to engulf me and now I am equally furious in the knowledge that it will stop me from speaking up in the future," she said. As she got off the bus, she was confronted with yet another group of aggressive catcallers. "​They taunted and made sexually explicit gestures towards me out the window," Stanley said. The experience of that night, one of many in a consistent patter of abuse suffered at the hands of street harassers, left her emotionally overwhelmed. After reading so many stories like this and hearing from so many women who have tirelessly explained why catcalling is wrong and disturbing, it remains a mystery why men still feel so entitled to continue this behavior.